What can you make out of nothing in particular? In recounting the origins and history of Fishs Eddy, an iconic New York store selling reclaimed dishes, co-owner Julie Gaines begins with her sense of herself: “I was no particular standout. Jealous of my two pretty sisters and stuck at 4’11” when everyone else kept growing, mediocre could have been my middle name. . . . But underneath the plaid shirts and clogs . . . was a small spark of certainty that someday, somehow, I would find a way to fit into this world.” Defying this dream of “fitting in,” Gaines instead narrates the experience of standing out through charming oddity and ferocious independence. Gaines met her husband in New York City’s West Village in the early 1980s. They shared the dream of freedom through owning a store. Any store. They chose a storefront simply because it was “for rent,” sold odds and ends from flea markets, and named the shop after a tiny, random town in upstate New York. It’s the kind of story that charms and irritates later arrivals to the city. The story is layered with serendipity and Baby Boomer good fortune: they discover troves of discarded dishware from hotels and restaurants, and reselling this becomes their stock in trade. It’s charming. Their mothers run the shop badly, but they still make sales! In the chaos of the late 20th century, these two free spirits make a life for themselves “doing dishes.” How dare they! Except, it is charming. The book’s illustrations (done by the store’s founders’ son) are simple and stumpy-legged, like the artwork of someone learning to draw. They convey the sense of learning as you go, and of doing your best without knowing which details might prove to be most important. Gaines’ presence at the center of the story reinforces her smallness in a city of tall people and tall buildings. All she can be, in the midst of that aspirational setting, is her little self. Some of the connection between store and city is coincidental. Julie sketches the New York City skyline onto a napkin, and they arrange to have it printed on dishes, the store’s first signature product. This might be a footnote, except the design became intertwined with the city’s post 9/11 mourning: “We didn’t understand why there would be candles and flowers at the store until we got closer and sat that the little memorial was left outside the window because our New York City Skyline dishes were displayed inside.” Gaines is never self-aggrandizing about herself or the store. The intersection of image and culture appears to be a natural manifestation of a free-spirited corner of a creative city, and she simply finds herself a part of that. The later parts of the book explore the store’s struggle to shift from whimsical shop to global enterprise. A series of CEOs mismanage the business, abuse the staff, and emotionally terrorize the owners. Though this section is autobiographical, it is also an allegory for the intensifying capitalism of the 21st century and the difficulties of being both individual and compassionate in a corporate haze. Gaines mixes triumph with personal crisis in the book’s conclusion. The family regains control of the store and returns to “doing dishes” as a joyful and creative vision. Julie is diagnosed with multiple sclerosis. The need to refocus in the face of this revelation drives the store’s rebirth: only by focusing on the intimate, the individual, the creative, and the compassionate can she survive. 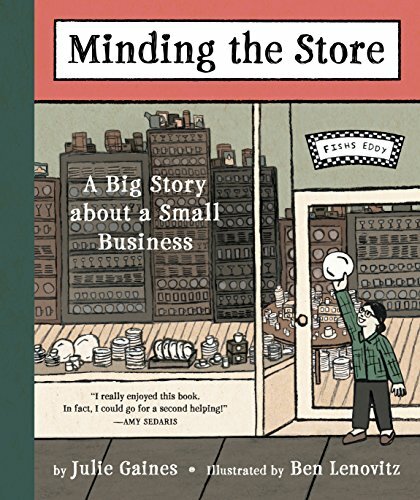 Minding the Store manages to move beyond a niche history of an NYC landmark to offer real insight into the potential meanings of small business. Never saccharine, often wry, always charming, this book seduces its readers and infects them with the desire for whimsical dishes and intimate connection.